A new display at Leddy Library highlights student work alongside material from Leddy Library's Rare Books and Special Collections and the Southwestern Ontario Digital Archive (SWODA). This fall's History on the Web class (43-397) asked students to engage with questions related to how history is presented, read, preserved and shaped by digital technologies. Taught by Dr Rob Nelson (History) and Dr Heidi Jacobs (Leddy Library), the class read about digital history and talked about how history and the practice of history is both shaping and being shaped by new technology. Most importantly, students had hands-on experience creating history on the web. “Walking Through History: Neighbourhoods of Windsor and Essex County” is a series of web exhibits and walking tours where students researched five neighbourhoods and created walking tours and digital exhibits documenting important buildings and sites. 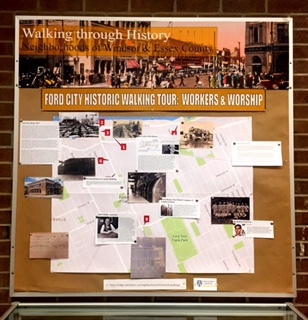 Ford City: Workers and Worship is one of these five exhibits. You can see the full project at http://cdigs.uwindsor.ca/neighborhood-history/fcwalkingt The students who developed the Ford City site are H. Priebe, G. Reid, D. Lesperance, D. Walls, and M. van Duinhoven. 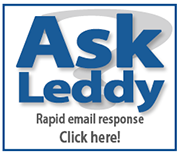 Many thanks to Dave Johnston of Leddy Library’s Centre for Digital Scholarship and to Carina Luo of the Academic Data Centre for their invaluable help with this project.